Ultra B Complex incorporates coenzyme (active form) B vitamins, functional flush-free niacin, and enhanced-absorption choline in a complete B-complex formula. Ultra B Complex incorporates vitamin C and coenzyme (active form) B vitamins, functional flush-free niacin, and enhanced-absorption choline. Vitamin C and B vitamins support the body’s nervous system to deal more effectively with stress. The B‑complex vitamins are named so because they are found together as a complex in food. They have complementary actions and work together in the body. B vitamins are responsible for a myriad of physiological functions which include the metabolism of fats, carbohydrates, and proteins; the formation of red blood cells; and the maintenance of good health. B‑complex deficiencies are widespread. One study at Tufts University suggests that over 39% of people had low values of vitamin B12. B vitamins are water-soluble, and any excess amount is immediately eliminated through urine. Since none is stored, it is important to have a consistent supply. 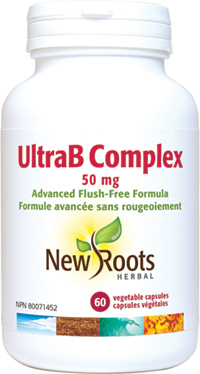 New Roots Herbal Ultra B Complex uses coenzyme (active form) B vitamins for maximum absorption. The results are impressive: a fast-acting B complex that does what B vitamins are supposed to do—actively support the mind, mood, nervous, cardiovascular, and digestive systems. Adults: Take 1 capsule daily with a meal or as directed by your health-care practitioner. Also contains: Vegetable magnesium stearate, microcrystalline cellulose, and silicon dioxide, in a non‑GMO vegetable capsule composed of vegetable carbohydrate gum and purified water. Purge Parasitis Program is a comprehensive group of products dedicated to the elimination of parasites. The Body Rejuvenation Program is a unique blend of proven specialty preparations, chosen for their cleansing/revitalizing qualities. Our liquid extract of North-American black walnut is used to eliminate parasites, heal skin disorders, and help to promote digestion.